A baby shower candy bar game is just one of many ways to help create a fun atmosphere for a successful baby shower. If you want the laughter to flow, we've got some great games for you! I'm going to give you step-by-step instructions in this article for playing a really funny dirty diaper baby shower games, but this isn't the only baby shower candy game we have for you. In fact, if you pop on over to our candy games page, you'll find links to all of party games that involve candy in one way or another. You can choose to use any of those listed as a baby shower candy game, whether they have "shower" in the title of the game or not. All it takes is the tiniest bit of tweaking and candy games can be used interchangeably for birthdays, bridal showers, baby showers, holidays, family reunions, or any group get-together. The truth is, most of the games don't need tweaking at all! Your guests will love them, and they really help to break the ice and get everyone involved in the party. 12 disposable diapers (clean, of course!) You can use cloth if you prefer, but you'll have to wash the chocolate out afterward, AND you'll have to improvise on labeling them - your call. With a permanent marker, number the diapers from 1-12, on the outside. On a master list, write down the name of each candy bar 1-12. Unwrap the first candy bar and cut off a nice chunk (about half). Place the candy bar piece inside the diaper and pop the whole thing in the microwave to heat for about 30-60 seconds, or until the candy bar melts. 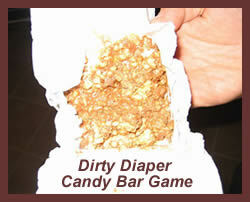 Repeat the process with all 12 candy bars and diapers and you're ready to begin the game! Make sure each guest has a pen and paper to write their guesses on. Begin passing around the dirty diapers. The person with the most correct guesses at the end of the game is declared the dirty diaper winner. This baby shower candy bar game is always a big hit. They'll be moans, giggles, wrinkled noses and smiles all around. If you have a video recorder, get someone to record the event, because it will be even more funny to watch it back later! 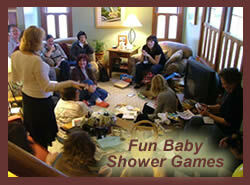 Hope your baby shower is a great success!